Armadillo skin is much like a shield of armor, and it has other interesting characteristics. Their skin plays an important role throughout their lives. Armadillos are threatened by dogs, large cats, and humans, among other creatures. With their topsides covered, they use their claws give them the ability to dig themselves into the ground, keeping them from being flipped over and vulnerable. Armadillos tend live out their lives in solitude, avoiding dangerous situations. The bands on an armadillo's shell are evident at a glance. The various species of armadillos, which number around 20, are identified according to the number of bands. The bands overlap one another, forming a shell that is flexible. This flexibility allows some species of armadillo to curl up into a ball if necessary, which is a great way to protect themselves in dangerous situations. In between each band is soft skin that has the ability to expand and contract. Mr. Armadillo's surface may look like armor, but it's a form of skin. 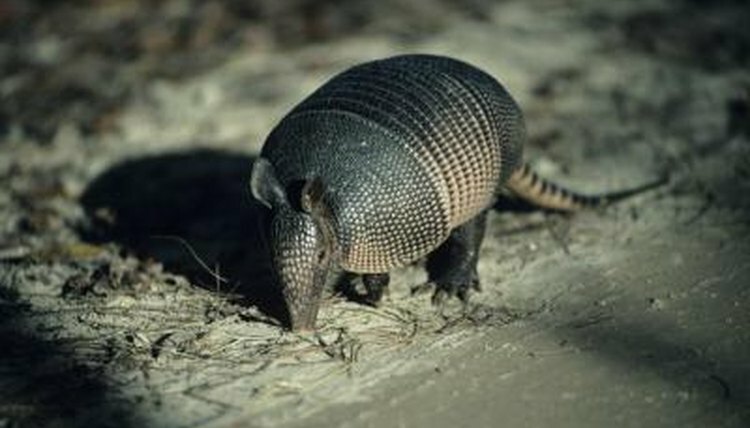 Although the shell may look thick, it is quite thin and prevents the armadillo from being able to regulate his body temperature. Armadillos have a low percentage of body fat and are warm-blooded mammals. As seasons change, they will change their times of activity. Warmer months may be spent living as nocturnal mammals, while colder months are often spent looking for food during the day and retreating to their burrows at night. A baby armadillo is born looking quite naked -- his shell feels a lot like leather. Within a matter of a week, the shell will harden, giving the armadillo pup the protection he needs from the elements. Around 2 to 4 months of age, the pup will wean and become independent from his mother. The top of the armadillo's head is covered in hardened skin referred to as scutes. All armadillos have this protective covering atop their heads. Limbs are also covered in hardened skin plates. The color of an armadillo's shell is generally brown or gray, but a species of armadillo known as the pink fairy armadillo boasts a pink shell. This species of armadillo has thick white underside hair.